Prepaid cards are wildly popular. But do they make sense for you? Here's what you need to know. NEW YORK (CNNMoney) -- Prepaid cards are wildly popular. But if you're in the market for one, it's important to know what you're signing up for. They may be your only option: If you can't open a conventional checking account because of a bad financial track record, a prepaid card may be one of your only options. If you live in an area where there aren't many -- or any -- bank branches, a prepaid card can also be more convenient than a debit card attached to a bank account, said Ben Jackson, a senior analyst at Mercator Advisory Group. Prepaid cards can typically be reloaded with cash at major retailers like Walmart or CVS. In some areas, there are more places to reload a prepaid card than there are bank branches -- especially in lower-income neighborhoods, where banks generally open fewer branches, he said. Certain prepaid cards even offer larger networks of free ATMs than some banks. The Green Dot prepaid card, for example, gives customers access to the MoneyPass network of more than 22,000 free ATMs nationwide. "For a lot of low- and moderate-income consumers, to get cash when they need it is extremely important because these folks are living paycheck-to-paycheck, so convenience is a huge value," said Jackson. Watch out for the fees: The average prepaid card charges nearly $300 in basic fees a year, such as monthly charges, ATM fees and reloading fees, a recent NerdWallet study found. In addition to these basic fees, many prepaid cards also charge activation fees, transaction fees, bill payment fees, declined transaction fees, inactivity fees, customer service fees and paper statement fees. If you're able to open a conventional checking account, you'll typically run into fewer charges, NerdWallet found. Checking accounts from the five biggest banks don't charge reloading fees, and ATM use is free, as long as you stay within their networks. Monthly fees for these bank accounts average $110 a year if customers don't meet requirements to get fees waived like carrying a minimum balance. 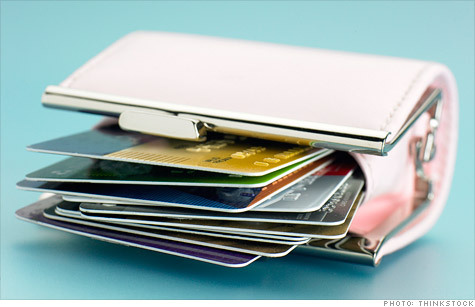 There are ways to minimize fees: Not all prepaid cards are so fee-heavy, however. Depending on the card, some of the fees may be relatively low. The only fee the American Express Prepaid Card charges, for example, is $2 for ATM withdrawals. Prepaid cards can also be a better option for chronic overdrafters. Overdraft fees -- incurred each time you overdraw your checking account if you opt in to overdraft protection -- range from $15 to $30 a pop and can really add up if you make it a habit. "Prepaid cards can be cheaper than bank accounts," said Jackson. "Some consumers are paying large amounts of fees to banks -- whether that be in overdraft fees or other fees -- so depending on the card and the way in which a consumer uses it, they can become less expensive." Even if you get one of the pricier prepaid cards, there are ways to avoid some of the fees. To avoid taking a hit at the ATM, for example, you can request cash back for free when you check out at certain retailers. And you can skip some fees for reloading your card at the local 7-Eleven or some other retailer by using direct deposit instead. They don't build credit: Using a prepaid card doesn't help you build credit with the three major credit bureaus. Some cards advertise relationships with credit bureaus, report to alternative credit bureaus or offer credit score trackers and access to credit reports. But don't be fooled into thinking they are doing anything to boost your credit score. For now, prepaid card data isn't reported to the credit bureaus because it isn't related to a debt obligation, like a credit card or mortgage. If you're looking to build credit, consider applying for a secured credit card, which is essentially a credit card funded with your own money. They are targeted at customers with poor or limited credit, and most of them report payments to the major credit bureaus. Prepaid cards are missing important protections: Prepaid cards may look and feel just like a debit card, but many are missing the protections offered by debit cards attached to bank accounts. While bank accounts are required to cover certain losses in the case of fraud, theft or error, the same legal protections generally don't extend to prepaid cards, according to Consumers Union. So if someone steals your card and uses it to make fraudulent purchases, you may not get your money back. Even if a prepaid card issuer does offer the same coverage, it's voluntary, so they are able to revise or rescind their contracts at any time. The consumer group also warned that many prepaid cards may not have the same FDIC insurance that bank accounts provide in case a bank fails. "Even if the prepaid card website displays the familiar FDIC logo, it's not always clear whether the cardholder will be able to recover the full amount on the card or a portion shared with other prepaid cardholders," Consumers Union said. Correction: An earlier version of this article incorrectly identified the credit card analyst at Credit.com.